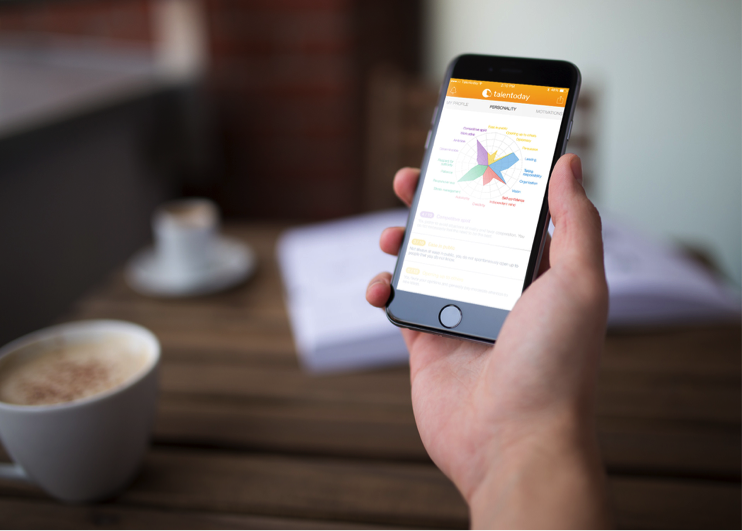 With the release of the free iOS application, ‘Talentoday – Personality test for your career’ you’re able to quickly discover your personality and soft skills: armed and ready to ace your next interview! Developed by accredited psychologists, the Talentoday personality test is also available online. Since the site’s launch in January 2014, the assessment has been taken by millions of people around the world. Within a few minutes, users receive in-depth insights about their soft skills, motivations and personality – a report that would typically only be available for a large fee and with an expensive debriefing from a career coach. After a quick sign up process (by Facebook, LinkedIn or email), take a 10-minute test. The Talentoday personality test consists of 128 forced-choice questions. It’s very quick and easy – just swipe up and down. Choose the answer that fits you best, there are no wrong answers! The elegance of the test allows you to take the test on the go, having fun while preparing for your career and future. Immediately after you complete the test, you will learn about your personality and motivations. With the personality radar, discover your strengths in 5 main clusters: Communicate, Manage, Dare, Adapt, Excel. These 5 clusters are subdivided into more specific personality criteria, such as stress management, leadership, and ambition. The results provide you with in-depth data-driven insights for your career. This comprehensive overview allows you to quickly discover yourself and your unique personality. From students seeking internships, to professionals preparing for interviews, or even someone who’s simply looking for a fun way to compare personalities with others, Talentoday empowers individuals to discover and showcase their unique soft skills. This user-friendly experience is available for free in the App Store, challenging the distribution of older, more traditional assessment tools, such as Myers-Briggs, StrengthsFinder, or other expensive solutions. With a fun and modern approach to psychology and careers, Talentoday’s personality test will help you to know yourself better in just 10 minutes. Even better, every 6 months you can retake the test to see how you’ve grown. So, what are you waiting for? Discover what makes you unique – today!